Located in the hustle and bustle of downtown Richmond, Virginia, Wong Gonzalez is definitely one-of-a-kind in the River City. Not only is the space bright and beautiful, but it’s the only place in town you can find Mexinese food. Although it’s a newer addition to the prolific EAT Restaurant Partners group, Wong Gonzalez sets itself apart from the pack with a delicious Chinese-Mexican fusion menu, a killer Happy Hour, and a selfie-inducing bathroom. Thanks to Bar Manager Tony Hairston, the cocktail menu is just as unique. With drinks like Baby One More Time and Boujie-Vardier, the cocktail list at Wong Gonzalez is just as playful as the kitschy, Old Hollywood interior. We recently chatted with Tony about his favorite drinks, his bartender beginnings, and his amazing Belle Isle cocktail on draft (!!!). Read on to get that recipe, plus another one: the spicy, smoky Strut. I’m Anthony “Tony” Hairston, Bar Manager at Wong Gonzalez. I’ve been bartending at Wong Gonzalez for a little over two years, but in general for about six years. What first got you behind the bar? I was serving at the time, and one of my friends who was the bar manager just kept encouraging–as well as nagging–me to work behind the bar. One day I just said, “Fine! I’ll give it a try,” and that’s all she wrote. Any pro-tips for someone starting out behind the bar? Someone once told me when starting out bartending that a good thing to do is go to other bars. 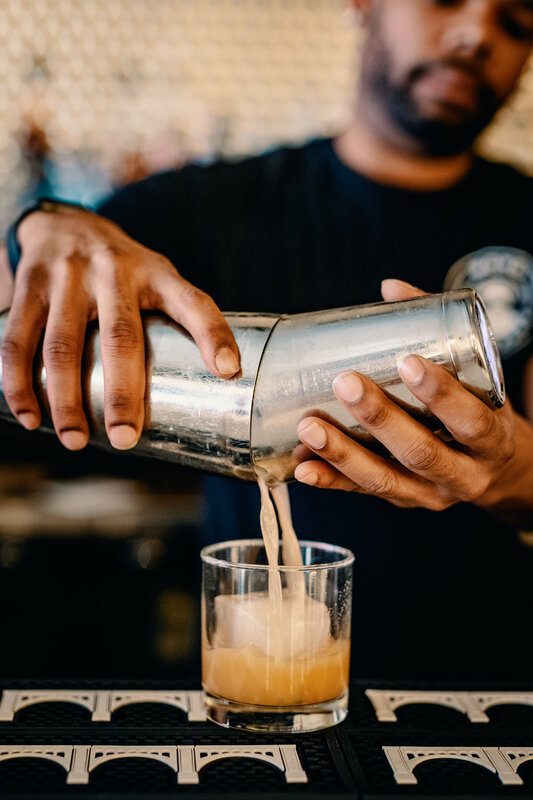 Check out how it’s run and learn from watching other bartenders’ techniques, such as how they stir a cocktail or shake a drink. Favorite drink made by someone else? I think maybe a Strawberry-Mint Mojito topped of with a little bit of Champagne. Favorite drink that you make? Currently on our menu we have a Sorry Not Sorry cocktail (#SNS) that I think is pretty delicious. It’s made with peach vodka, blackberry-peach syrup, lemon, tea, and ginger beer. My second-favorite is our Saint Amy–jalapeño-infused tequila, elderflower, pineapple, lemon, and lime. Favorite thing to drink when no one’s looking? Tequila! It’s my go-to, as most people know. If you had to pick one cocktail ingredient to use for the rest of your life, what would you choose? Honestly, any of the Belle Isle Moonshine spirits. They always work well when creating cocktails! What’s your favorite part about working at your bar? What’s not to love about Wong? It’s beautiful inside. We have really good food. Our Happy Hour is pretty awesome, and we have it everyday we are open–including Saturday and Sunday! We are located in a great area, so we get a mixture of guests that come in, from business people getting off work trying to catch happy hour to a group of ladies having dinner before going to see a show at one of the venues nearby, to a late night pop of people coming in right after partying at a wedding reception. I do think the number one best thing about working at Wong is family. Not only is the staff some of the best people I have worked with and grow with, but EAT Restaurant Partners itself is probably one of the best companies to work for! What makes your bar unique? I think the visual aspect of the bar does attract a lot of people. We also pride ourselves on having a great amount of different spirits–especially tequila, vodka, and bourbon! Our bar is a place where you can come by yourself and not have to worry, or meet up with a group and not feel pressured or rushed. And again, you can’t beat the Happy Hour! Where do you like to stop in for a drink? I’ve been hanging out in the Fan and Carytown areas. Some places I like going are The Jasper, Weezie’s, Buddy’s Place, and Babe’s of Carytown, just to name a few. What’s your take on today’s cocktail culture in your city? I like the trend of how cocktails are being made today. I feel like more people and restaurants are becoming innovative with cocktails, which makes it exciting to try something new. When I first started, a “complicated” drink was a Long Island. Over the years, I have been able to learn and grow as a bartender, and explore new methods of creating cocktails. It’s fun to learn not only what’s in a cocktail, but the reason why it’s made a certain way. Give us your golden rule when it comes to bar etiquette. Wow, a loaded question! There are so many. I guess for guests: waving money around yelling “Yo, bartender!” while there are a plethora of other guests before you is not going to get you a drink any faster than the rest of them! 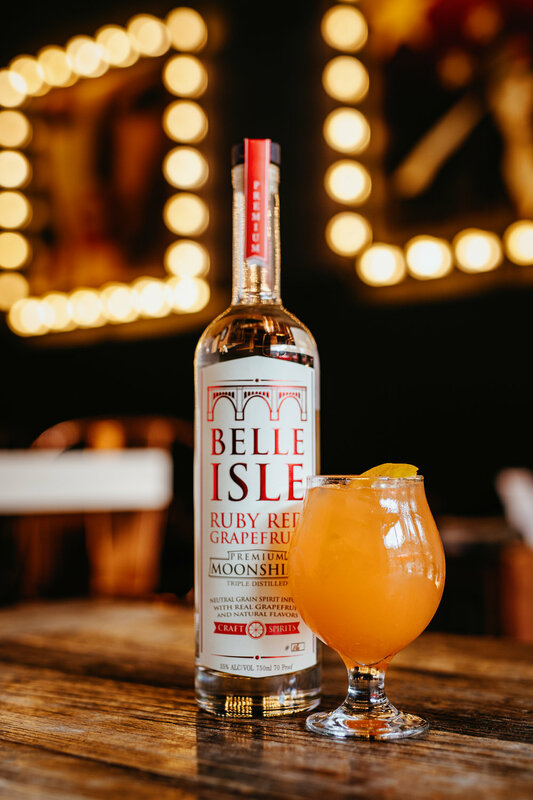 What’s your favorite way to drink Belle Isle? 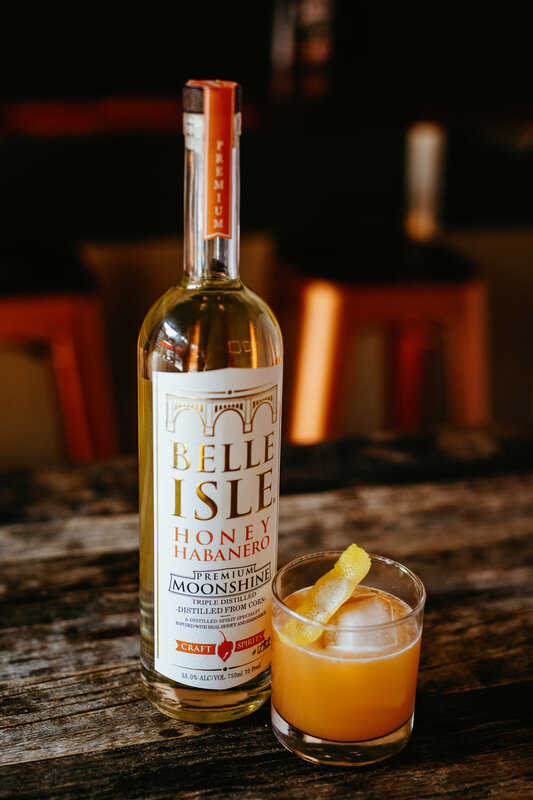 I like the Belle Isle Black Label, Honey Habanero, or Ruby Red Grapefruit with some freshly squeezed lime and lemon juice and some simple syrup. Something very easy to make, yet refreshing. Combine all ingredients in a mixing tin over ice. Shake and strain into a rocks glass over ice. 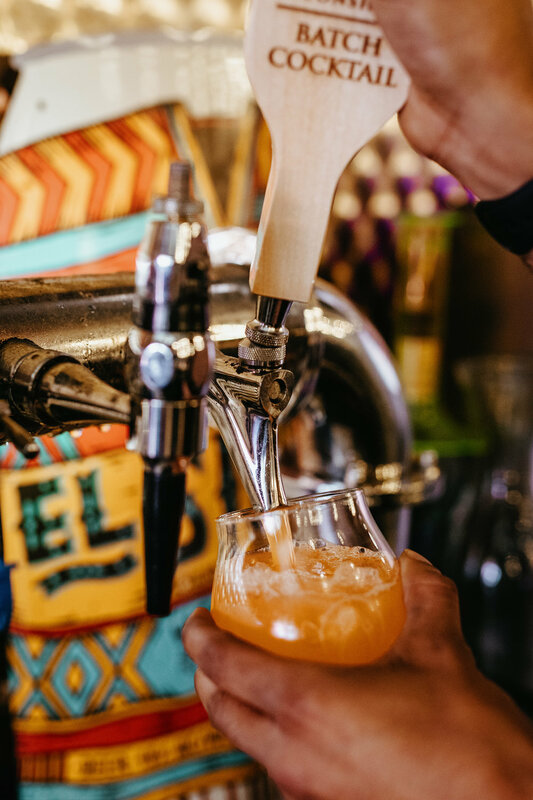 **Featured on tap at Wong Gonzalez! Combine all ingredients in a mixing tin over ice. Shake and strain into a rocks glass over a big ice cube. Spritz with mezcal. Wanna know more about our story?